High Performance Liquid Chromatography (HPLC) is an analytical technique which utilizes a compound’s intrinsic affinity for both a “mobile phase” (typically a buffered solvent) and a “stationary phase” (porous solid support with specialized coating). Essentially, a pump is used to provide a continuous flow of a solvent into which a dissolved sample is introduced. Once the sample is in the solvent flow, it travels through an analytical column. The compounds present in the sample mixture are then separated depending on their affinity to the coated particles in the column. After the components in the sample are separated, they may pass through an assortment of detectors. The detector response and the “retention time” (time it takes for a compound to pass from the injector to the detector) of the compound(s) of interest may then be compared to a reference material. 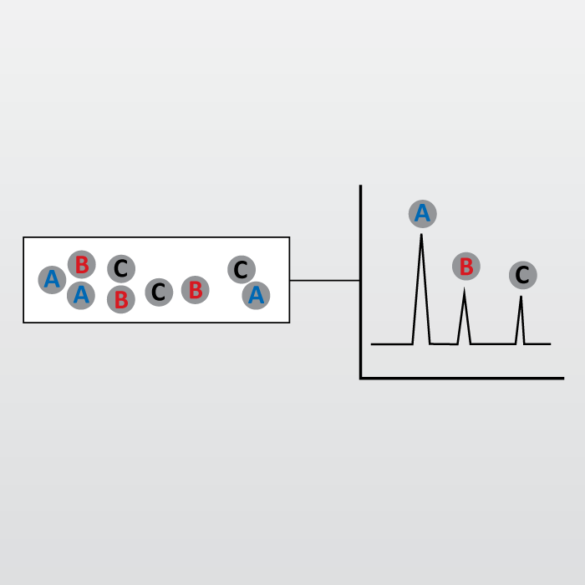 At EAG’s analytical labs, a number of chromatographic techniques may be used to customize High Performance Liquid Chromatography analysis for a specific sample matrix. In addition, a number of detection techniques may be utilized to analyze for a specific type of compound. Biochemistry for the analysis of constituents of a compound. Separation and identification of amino acids, nucleic acids, proteins, hydrocarbons, pesticides, carbohydrates, antibiotics, steroids and countless other organic and inorganic substances.